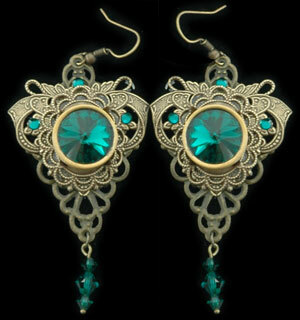 A stunning deep emerald green Swarovski crystal rests in the center of layers and layers of antiqued gold brass filigree. Three tiny Swarovski crystal stones add a touch more color and 3 tiny emerald crystals gently drop below. Worn perfectly with my “Queen Victoria’s Jewels” necklace.